My parents divorced when I was 5 and I lived with my mother, except for occasional weekends, holidays, or summer breaks. When we lived states apart, I saw my father rarely and we stayed in touch by phone and mail. Long-distance calls were expensive back then (and we weren’t flush with cash), but mail was affordable and I loved writing and receiving letters. Some things never change. 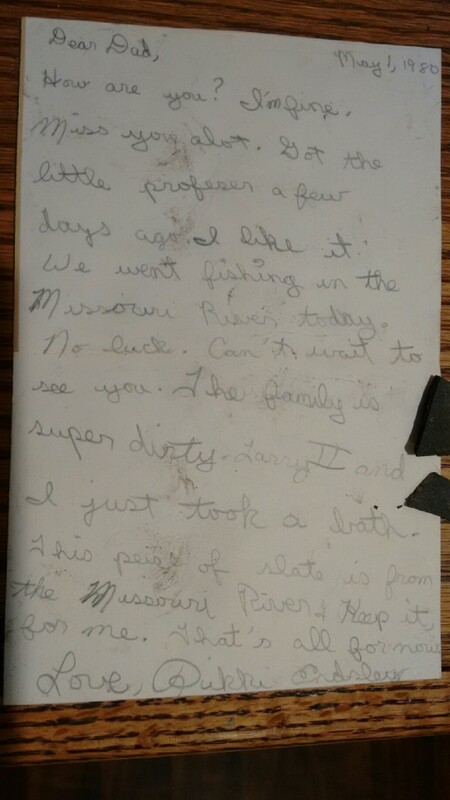 Recently my father has been cleaning and purging possessions, which means he’s also running across a few gems, like this letter from a 10-year-old me telling him about a recent fishing trip with my stepfather, my mother, and my baby brother (Larry II, aka Little Larry). In the letter, you’ll notice that I made an odd request. To the right of the letter, you’ll notice that my father fulfilled it. This peice (sic) of slate is from the Missouri River. Keep it for me.